Thanks for your comment. If you read my work on cosmology, you’ll quickly see I’m not a fan of the Big Bang theory. In fact I’ve often called it a fairy tale. On the other hand, neither do I think the three tier ancient cosmology featuring a flat earth accurately reflects the structure of reality. Here’s why: I believe a lot of the misunderstanding about the biblical teaching on the structure of the earth and the universe is due mostly to a faulty view on how to read and understand the word of God. What do we mean when we say we take the bible “literally”? What I mean when I say that, is that I understand what is being conveyed according to the context, historical setting and literary type or genre that the author is using. The author is trying to convey a message, and that message must be understood according to the context, historical setting and genre. This is typically called the historical-grammatical  method of hermeneutics (hermeneutics being the rules by which you interpret the text). Thus it is important to realize the Bible is not written as one long matter-of-fact statement. Yes, there is history and there are matter of fact statements, but there’s also, poetry, parables, prophecy, songs, laments, and other types of literature including even facetious comments not meant to be taken seriously. For example, what does God mean when he says in Amos 4.4 “Go to Bethel and sin; go to Gilgal and sin yet more.”? Is our holy God really commanding his people to sin? Or is he being facetious to make a point? Or consider: Do you believe the earth has four corners? If not, why not? After all, the Bible says, “After this I saw four angels standing at the four corners of the earth…” Rev 7.1 also 20.8) Or is that four corners statement just apocalyptic imagery – and you understand it’s not meant to be taken “literally”? Do you believe God has feathers and wings? Because the bible says “He will cover you with his feathers, and under his wings you will find refuge” Ps 91.4. Or is that just a protective image God is drawing of himself? How about the fiery serpents of Num 21.6: הנחשים השרפם (hanechashim haseraphim) Literally “burning serpents”. What does that mean? And the word “seraphim” should look familiar. It’s how some angels are described (Isaiah 6.2 literally “burning ones”). Were the snakes therefore burning like angels? Were the snakes a type of angel? Were they fire breathing snakes? Or did the snakes merely possess a venom that burned like fire when they bit you and injected the venom? That’s how the NIV takes it (Num 21.6) and I would agree. 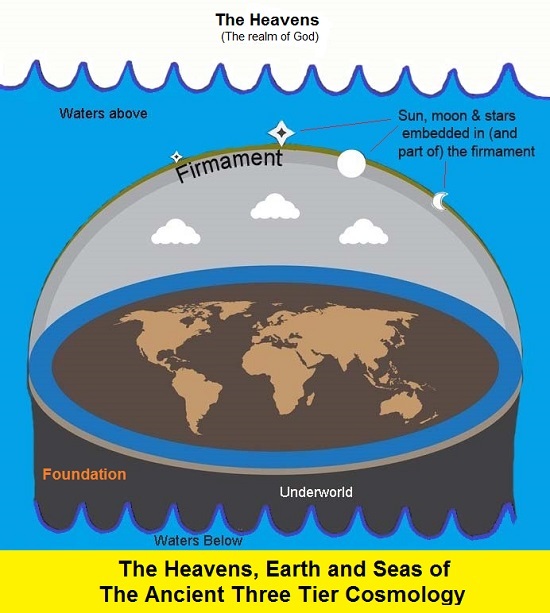 In passing, since the earth of the 3 tier flat earth universe is surrounded by water (as depicted above) it is also important to understand the waters of “the deep” (Gen 1.2 KJV) as well as the waters under and above (Gen 1.7) the “raqiya”. I won’t discuss that here other than to say Dr. Russell Humphrey’s makes a good case for his model of what the deep and the waters below and above mean which I discuss in “More Big Bang Magic Tricks – Shadows and Waves“. Once these words are put in proper context it’s easy to see that most of what the Bible discusses is discussed in a manner that is called phenomenological – merely a description of events as we see them, not a statement of science. Even we do that. Do you ever speak of sunrises or sunsets? That’s phenomenological because the scientific description would be more like “the earth revolving revealing the sun” for sunrise; and “the earth revolving hiding the sun” for sunset – if we’re speaking to be scientifically accurate. But even we, with our 21st century understanding don’t speak that way! (Even if you believe in one of the flat earth theories a more accurate description would be the sun circling – since the sun doesn’t actually rise or set in that model either.) We describe phenomena – sunrises, sunsets. Do you speak of high pressure areas moving into low pressure areas creating strong air currents, or do you speak of gusty winds blowing? What about the Aurora Borealis? We call them the “Northern Lights” a phenomenological description – not “the electrically charged particles from the sun bouncing off the earth’s magnetic field near the poles display” which would be more scientifically accurate. We don’t speak with scientific precision today. Why would we expect people in ages past to do so? As for the earth moving – There is ample evidence that the earth is not fixed. Have you seen a demonstration of a Foucault pendulum? It works on the principle similar to that which allows gyroscopes used by planes to indicate attitude – (that’s attitude – position in space – not altitude) to work – rigidity in space. If you like to travel I suggest a trip to a museum that has one because they are proof that the earth is spinning. They allow you to see where the earth has been (orientation wise) – and you can see where it will be going. Another indication of the earth’s motion: Parallax view of the stars. Scientist use Parallax  to measure the distance to nearby stars. Note – such a divergent view of the star’s position is impossible if the earth were indeed fixed and unmoving – and the stars fixed in the firmament. As for Einstein – I think you’re a bit hard on him. Clearly he does not get your vote for person as the Century as Time magazine named him. But you fail to recognize the great contributions he’s made and the confirmations of his theories that science has made. Do you use GPS? If so you’re confirming Einstein’s theory of relativity because what is GPS? – It’s a giant, precise system of measuring time – the time it takes radio signals to get from various satellites to your position. It finds your position through triangulation. And in order for it to work accurately, the designers calculate in the relativistic time differences – because according to Einstein, due to the distances to the satellites an effect called gravitational time dilation comes into play. The effect being the closer you get to a large gravitational source (like the earth) the slower time runs, and conversely the farther away you get, the faster it runs. Thus the clocks on the satellites in orbit run faster than clocks on earth – and they have to account for that difference in time for GPS to work. Einstein’s Theory of Relativity predicted Gravitational waves and those have been detected by Ligos. (see here). Einstein also predicted gravitational red-shift and that also been detected. (see here). There have been other confirmations of his theories but I think the point has been made and clearly your count of his accomplishments is wrong. Finally, as you might know – scientists rarely talk about things being “proven.” Things can be dis-proved – but “proof” of the truth of a theory is much harder. They speak of theories being repeatedly verified. Einstein’s theories of General and Special relativity have been repeatedly verified. When viewed this way, there is no compelling verse or passage (or passages) that indicates we should believe the Bible teaches the “Three Tier Cosmology” model as indicative of the actual structure of the universe. Much of what is described is phenomenological. And if you insist the 3 Tier model is there, it should not be understood to be describing the actual structure of the universe anymore than if I say “I flew down to Florida for vacation” should you understand me to be saying the actual method I used to fly was to grow wings and feathers and flap my way down to Universal Studios! This entry was posted in Bible, Cosmology, Creation, Flat earth, General Relativity, Gravitational Wave, Science and tagged Albert Einstein by Duane Caldwell. Bookmark the permalink.